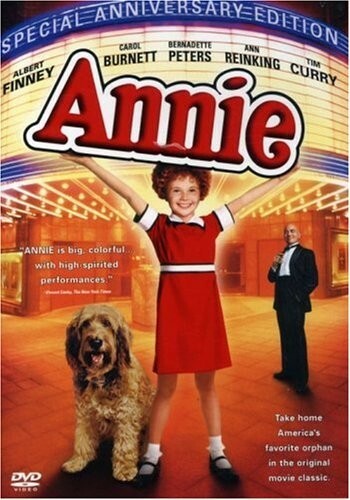 To celebrate the 20th anniversary of Annie's hit debut on Broadway, we present the classic movie version of the beloved musical, now digitally remastered and featuring the original theatrical trailer. Annie is the story of a plucky, red-haired girl who dreams of life outside her dreary orphanage. One day, Annie (Aileen Quinn) is chosen to stay for one week with the famous billionaire "Daddy" Warbucks (Albert Finney). One week turns into many and the only person standing in the way of Annie's fun is Miss Hannigan, the gin-soaked ruler of the orphanage (played to hilarious perfection by Carol Burnett). Will Miss Hannigan's zany attempts to kidnap the irrepressible Annie succeed? Enjoy all the unforgettable songs, including "It's A Hard Knock Life" and "Tomorrow."